22", 33" & 54" cylinder by 42" Frontier Iron Works steam engine, 1100 hp @ 85 rpm. 2 - 12'3" x 12', 160# scotch boilers Wickes Brothers, Saginaw. Wrecked in "Great Storm of 1905". Battered to pieces on beach by storm. Hull lies 200 ft. from shore & bow & stern torn off &washed ashore. Boilers & engines removed from wreck 1919. 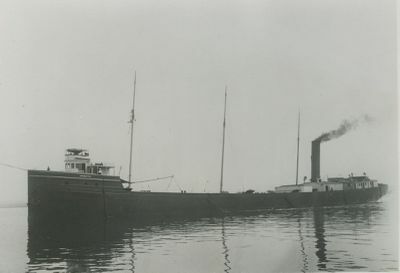 Largest wooden steamer ever built on lakes, carried chase towing machine & 1300 feet of cable, & generally towed barge.